Y'all, I'm hype right now - for a few different reasons. One, my product junkie-ism is in full swing - I'm getting to play in new products, experience new brands, and share them all with you guys. Two, the vast majority of the brands I'm experiencing are Black owned, and it feels good. For those of you guys who have been following me for a while, then you know I've been on the small and Black Owned business tip for a few years now. And I'm glad that as a solution-oriented measure, the conversation and action is picking up steam. I've finally organized my product reviews in a way that'll be helpful for you guys looking to support Black Owned brands and businesses - under the "Reviews" section, the first option in the dropdown box is Black Owned. Here is where you'll find all things Black business related. Reviews, features, write-ups, op-eds, and more. This feature works best via desktop/tablet, but you'll still get some value out of it on mobile too. And that's where Miche (prounounced mee-sh) comes in. Miche is actually the brand new product line and brainchild of one of my fav YouTubers Michelle B.//Everything Mich. I love Michelle's channel because she's genuine, honest, and I feel like we have similar-ish textures. Plus, she doesn't come across as stank - which I love. I don't support stank - on the internet or in real life, #ijs. After Michelle launched her line, I reached out to her for a collaboration/review - and that's where I found out we both are fans of each other's content. Lesson - you never know who's watching you! And here we are now - I'm about to give you the goods on LUSH Deep Conditioner with Raw Honey & Babassu Oil and POLISHED Hair & Scalp Oil with Argan & Jojoba Oils. Aloe Leaf Juice: Acts as a natural conditioning agent that restores the hair's sheen, luster, and shine. It not only makes the hair soft, but it also enhances strength and suppleness. Babassu Seed Oil: Oil pressed from the kernel of the Brazilian Orbigynya Palm Tree, with a similar chemical composition to coconut oil. It is able to penetrate the hair (to a degree), improving moisture, strength, elasticity, softness, and shine of hair. It is a wonderful alternative for those who want the benefits of coconut oil, but don't care for it in the hair. Geez, where do I begin?! I'm in love with LUSH. From the moment I opened the jar, I knew I had something special. First of all, I have a special place in my heart for great branding, packaging, and labels that don't wear off in the shower. So there's that. And then, there's the fragrance. It's delightful. Something like a watermelon jolly rancher or blow pop. It just takes me back to a simpler time - where my biggest concerns were making sure I was on the right side of the double dutch ropes to jump in, and avoiding "scratchies" while playing handball. It's sweet, fruity, nostalgic, and not at all overbearing. But what y'all really wanna know is, how does it work? Let me just say this - like magic. As you can see in the pic above, LUSH is super thick, creamy, and well, lush. It has a richness to it that made me an immediate fan. Despite its thickness, it soaked right into my hair, and made detangling a breeze. Yes, LUSH has amazing slip. I've used it as a quick deep conditioner (5-10 minutes), and also for the recommended 30-45. It doesn't matter what length of time I choose - LUSH always performs. After rinsing, my hair has that buttery smooveness that I crave in a deep conditioner (yasssssss! ), tons of shine, and is super moisturized. Needless to say, the first jar is almost gone. It's that real. While I always skew toward more natural fragrances (via essential oils and such), I really didn't mind the scent in LUSH. As mentioned previously, it takes me back to my childhood every time I open the jar. As far as LUSH is concerned, there's only two problems with it. One, I can't get it anywhere on the ground yet. And two, I need a 16oz jar. But I'm holding out hope. 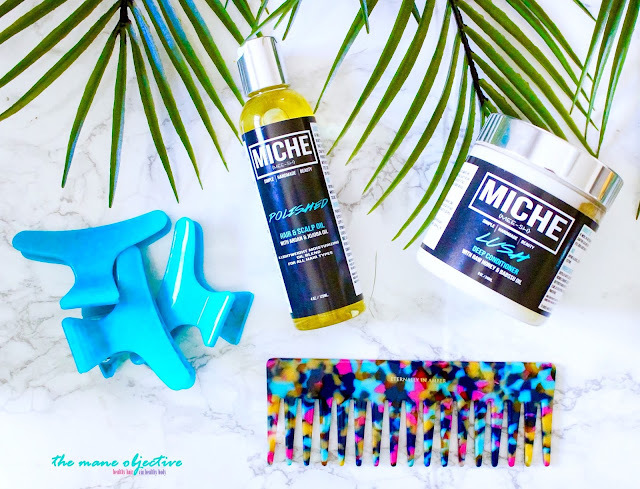 Because if Soultanicals, Obia, Mielle, TGIN, Alikay, and The Mane Choice can make it to major retailers, there's no reason Miche can't, either! 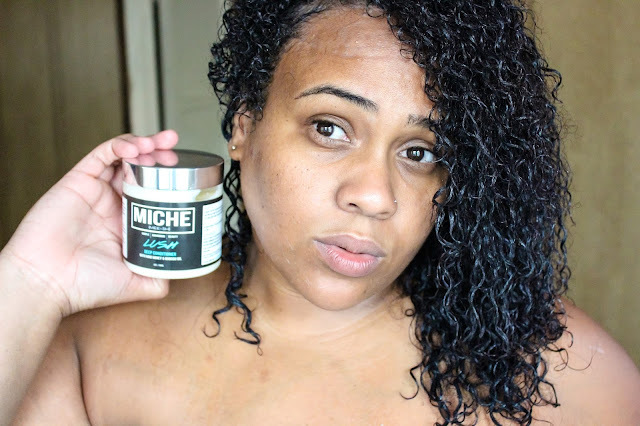 Miche's LUSH Deep Conditioner is the dry hair plug. Seriously. With the LA summer weather ranging from dry and crispy to breezy and tolerable, I'm relying heavily on LUSH to keep my tresses deeply hydrated and nourished. I absolutely love the ingredients, and I feel like Michelle definitely hit all the important markers for a moisturizing, detangling deep conditioner. If you're in the market for a deep conditioner that does what it says it's going to do - then definitely check out LUSH! I didn't buy the first one, but that don't mean squat! I'd absolutely buy this deep conditioner with my own money. I'm in a different sort of space with my natural hair - one where I'll shell out the dough necessary to keep it poppin'. That doesn't mean I'm spending fifty-leven dollars on magical curly potion pudding souffle gel custard #8. It means that if the product is under $20 and works, chances are it's coming home with me. The caveat to this is, the ingredient composition has to justify the price point. I'm not paying $19 for a product full of corn oil (not naming any names), but I'll come out of pocket for ingredients that work, ya know? Sweet Almond Oil: Smoothes hair cuticles, promotes hair growth and thickness, boosts shine. Caprylic/Capric Triglycerides: Fractionated coconut oil that is lightweight, nutrient rich, and fast absorbing. All the benefits of coconut oil without the heaviness. Extra Virgin Olive Oil: Olive Oil is rich in high levels of mono-unsaturated fatty acids and vitamin E. Vitamin E is an antioxidant, which is good for hair growth. Both mono-unsaturated fatty acids and vitamin E are good for moisturizing, protecting and nourishing hair. Olive oil makes hair grow stronger and its emollient properties prevent hair loss. Hair shine courtesy of POLISHED! Full transparency here - oils don't typically get me all in a tizzy, with the exception of a few that border on the miraculous, I'm a straight and narrow kinda gal when it comes to oils. Coconut oil in the warmer months, argan oil in the cold times. And when it comes to sealing my hair and ends, I forget to do it about 90% of the time. But even with all that said, I really like POLISHED. 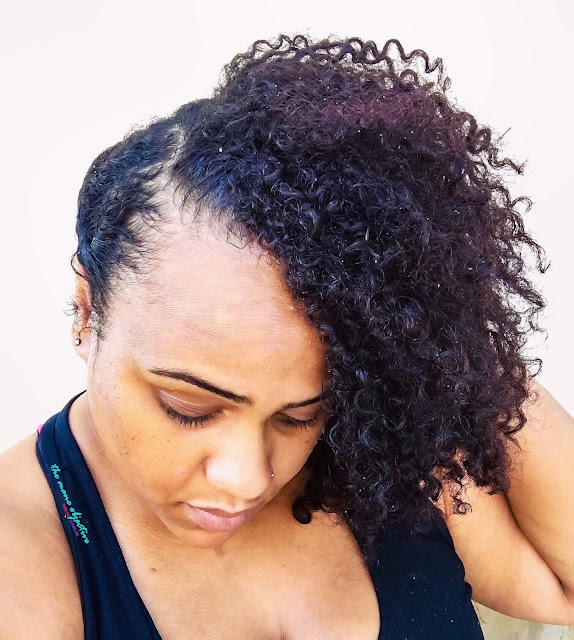 I think my oil-loving naturalistas will dig the consistency - its lightweight and packs a punch without being super greasy. It borders on serum-esque without the silicones. In fact, when I use POLISHED to seal, the end result is always super hand-in-hair syndrome, because my strands feel so silky smooth. I also appreciate the versatility of POLISHED - it works as a scalp oil, hair and ends oil, and hot oil treatment. I'm not much for hot oil treatments, but I did use it on my scalp and to seal my hair (when I remembered lol), and I was impressed. Especially for relieving scalp itchy realness. It added great shine and soothed my psoriasis-prone scalp without making my hair all soul-glo-esque. One last note on the fragrance of the oil - Michelle, thank you. I don't know if other folks know this, but a lot of oils actually stink. Not rancid, but not pleasant, either. Thank you for finding the perfect balance of fragance without being overbearing. To be completely honest, I'm not a fan of soybean oil. It has lots of nutritive properties, but it's just not something I'm personally a huge fan of. Even though POLISHED works great as-is, I'm curious as to what a formulation without soybean oil would look like. Would it alter the consistency or effectiveness? Just me being curious. It's not a dealbreaker by any means, just a preference thing. If you've got itchy scalp, or your strands lack luster, POLISHED is a great way to get the 2-in-1 benefits from one product. 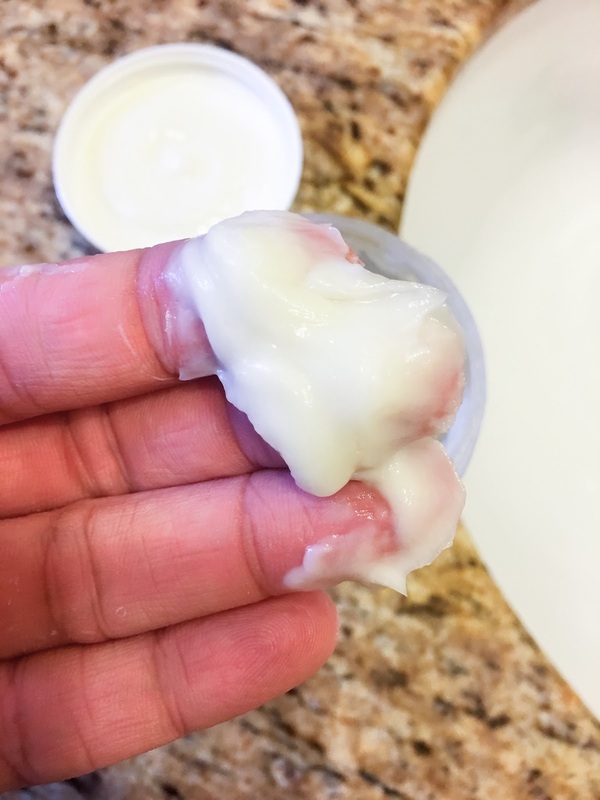 It smells great, has great ingredients, and doesn't weigh hair down and make it feel greasy or oily. When my next batch of henna arrives, I'll definitely be adding some POLISHED to the mix for lightweight moisture and shine! It depends. Not because POLISHED is a bad product - I'm really just waiting to see what Miche is going to release next, so I can throw my coins their way. Keeping my fingers crossed for a gel. And a protein treatment. Because I love protein. And because, wash and go's. I know, I know. #productjunkieproblems. Gotta prioritize and budget. 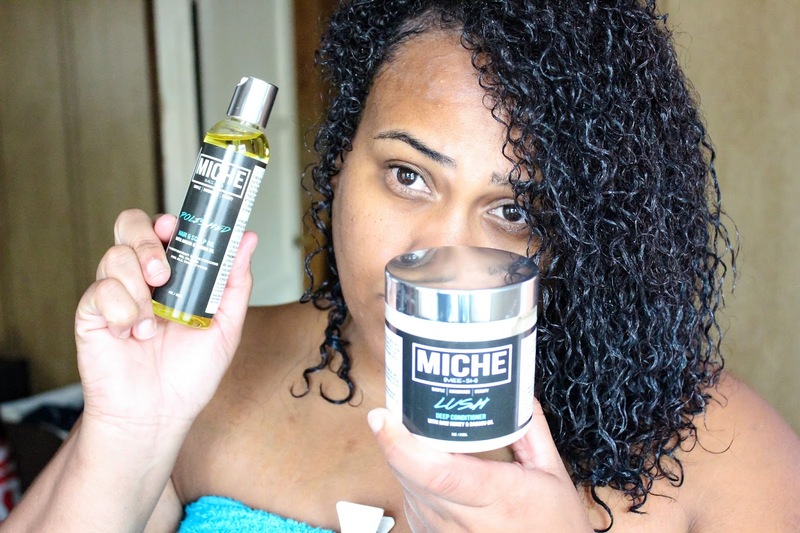 Have you head of Miche Beauty? Are you ready to try out LUSH or POLISHED? Let me know in the comments below! Yes I am in love with Lush...since I've rediscovered my natural hair I wasn't sure what my curl pattern was...one Lush treatment and Bam the curls appeared, my hair is soft and manageable and it smells good. I too am waiting on Michelle to expand her line. Yes, yes yes!!!! I can't wait either!